These are the words of Jim Forest published in an article, “What I learned about justice from Dorothy Day,” that originally appeared in the July/August 1995 issue of Salt of the Earth magazine. This article is really good and I highly recommend it. One reason being you really do locate the source of Day’s thinking and spirituality in the Eucharistic Heart of Our Savior, Jesus. Is there really anything more to be taught/learned by way of praying before the Blessed Sacrament? Jim Forest began his association with Dorothy Day in 1961, when he moved to New York City to join the Catholic Worker community there. Jim is the author of an excellent introduction on the life and work of Dorothy Day called All Is Grace. 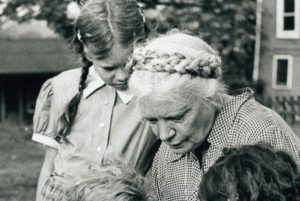 Dorothy Day’s caused for sainthood has been introduced. It would be good to learn from Day on how to be an authentic Catholic and not some secularist: Go to Jesus through the example of Dorothy!